For Sunday's fourth edition of the incrediby popular Slateman Triathlon we sent Karl Alexander off to North Wales to test out the "breathtaking (in every way)" bike course and "brutal" run. An adventure and a half, but one which he enjoyed, despite returning home with a few extra cuts, bruises with plenty of lessons learned. Now in its fourth year, the Slateman Triathlon is fast becoming an iconic must-do event. 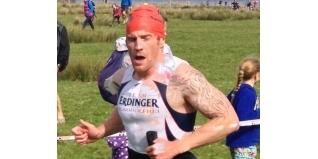 Held in the awe inspiring surroundings of the Snowdonia National Park, the race comprises a 1km swim in Llyn Padarn before tackling a 51km bike course with the breathtaking (in every way), Pen-Y-Pass climb and then hitting the trails for the 11km run which features the quad-busting 1.1 mile, 9% average gradient of the Slateman Quarryman Challenge, a brutal zig zagging route through the Slate Quarry that lends its name to the event. So, when I was asked if I would like to race and report back for tri247.com there wasn't too much thought given and having seen the televison coverage from last years event, I was eager to take on this spectacular race. The drive to Llanberis from High Wycombe was fairly epic and five and a half hours later my wife Helen and I, arrived at race HQ to register and collect my race number, swim wave colour coded hat and timing chip. After a quick scout of the swim course (from the shore), it was a short drive to the campsite. It would have shorter still if we'd booked one of the twenty or so we passed en route!! Having put the tent up, which always resembles a scene from 'The Chuckle Brothers', we looked for somewhere to eat, a local pub offering 'traditional beers and good food' seemed to be the only option and one large chill-con-carne and the majority of Helen's chips later, I was full enough to warrant heading back to get some sleep... ah sleep... I like sleep... sleep is awesome! However, it would seem that the seven billion or so sheep in the next field had other ideas. I didn't sleep! Neither did Helen. In news that will shock all men, she was cold! At 6am we decided to abandon camp and head back to the venue. With registration and transition opening at 7am we were early enough to secure a good parking spot. Life is full of little wins! With the race set to start with the Elite Men at 09:30, I was primed and ready to go! If I was still tired the brisk 11 degree waters of Llyn Padarn soon woke me up. 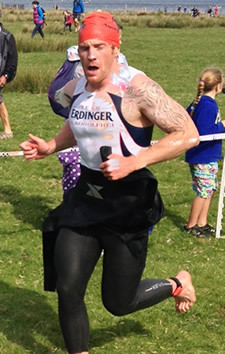 The 1000m swim felt good and my Xterra Vendetta wetsuit felt fantastic as I exited the water in 13th place. 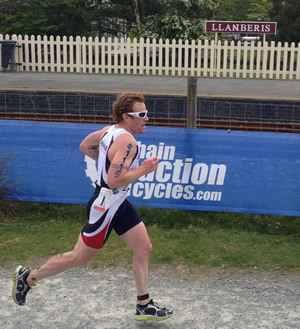 On the 200 metre or so run up to T1 I could tell something wasn't quite right and I wasn't firing on all cylinders. This feeling was magnified ten-fold when I faffed for what felt like an hour in T1; if I'd had a kettle I would have popped it on! Out on to the bike and within minutes you're on the daunting five mile climb of Pen-Y-Pass. I was part of a group of five or so riders and decided that the pace needed to be higher. Moving to the front of the group I passed several riders before I hit the summit. In hindsight I took the climb too easy; having only driven down the climb it seemed longer than it actually was and I kept too much back. Off the top it's immediately downhill and I went from 12mph to 35mph+ in just a few seconds and from then on I set about hunting down whoever was ahead. I was alone and riding hard. With five miles to go I caught and passed Oliver Simon, a well known Ironman Pro and kept the pressure on. I arrived in T2 in seventh position and once again made a brew whilst I put on my trainers - I must invest in one of those quick kettles! Out onto the run and running level with Oliver, you soon come across the Slateman Quarryman challenge. It was on this climb that I decided to add some danger by throwing myself to the floor and cutting up my hand. This didn't seem to hinder my progress, so a mile or so later whilst negotiating a steep rocky downhill section I twisted my ankle and fell again - ok so they weren't deliberate, but they certainly affected my run performance. I was pushing hard to finish well and I overcooked it - No guts; No glory!! I crossed the line to tenth place, and all things considered, the epic drive, the frankly unreasonable sheep and the self-harm I'm actually pleased with the result. I made mistakes (I took the bike leg far too easy), and I will learn from them. At the pointy end of the field it was the usual suspect of David Langston who led out of the water followed by last years winner Stephen Skates, but an epic ride from Ewan Brown saw him into the lead. He backed up the fastest bike split of the day with the fastest run split to cross the line in 2:21:48 nearly three minutes clear of second placed Skates. The third step of the podium went to Rory Atkins. In the women's event, last years second placed Jane Hansom was the hot favourite but with Ironman 70.3 Mallorca in her legs from the previous week she was aware she had a tough day ahead. In the end Suzy Richards led the race from start to finish clocking a superb 2:44:23 and with it a new women's course record, it was to be a close affair with Natalie Seymour coming into second place a little over a minute later with the fastest run split and Jane Hansom rounding out the podium. I'll be racing next at the Belvoir Castle Triathlon. If you see me, come say hi - just don't shake my hand as it has slate in it! !